Really, this is so simple…you just toss all the ingredients onto a sheet pan and toss them in the oven! I love meals like this because I love the taste of roasted veggies and baked chicken (I also *love* my crock pot, but there's just something about the flavor of an oven-baked meal). Combine lemon juice, oil, oregano, rosemary, thyme, garlic, salt and pepper in a small bowl and mix well. Place the chopped vegetables on a sheet pan and toss with half of the lemon sauce. Place the chicken breasts on the sheet pan and brush the remaining sauce on both sides. 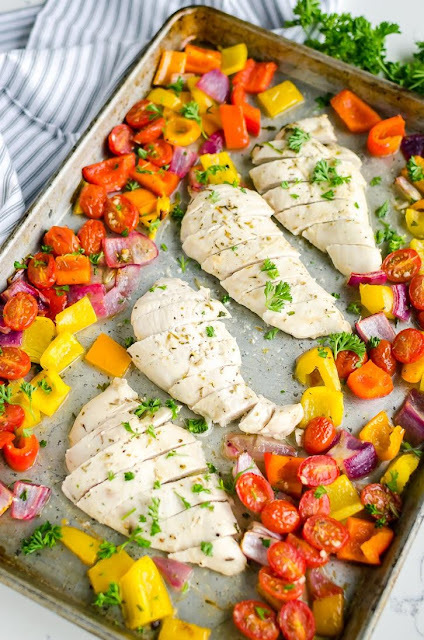 0 Response to "21 Day Fix Lemon Garlic Chicken Sheet Pan Dinner"